Sporting a custom T-top, helm cover, seat cover and outboard engine cover, this boat is well protected with custom marine canvas covers. A T-Top is the perfect solution for the fisherman who needs full walk-around access to all open areas of the boat. T-tops allow you to do without the annoying frames and straps of the more conventional bimini top, while still providing some shade for you, your crew, and your cooler. 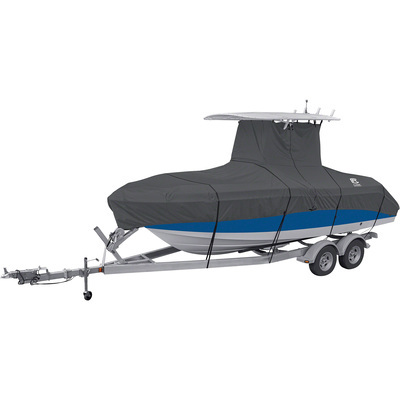 Boat T-Tops are available in a wide variety of sizes and configurations to fit almost any boat, and they can be purchased with rod holders, antenna mounts, radar arches, electrical boxes, rigging for lights, and other accessories and fittings to make your fishing days easier. T-tops are generally available in either fiberglass or canvas. Additionally, there are many custom T-Top fabricators who will custom design and make a T-Top for your boat if needed. Most canvas T-tops are made of Sunbrella marine canvas for maximum durability, UV resistance and waterproofing. Fiberglass T-tops are rigid and more durable, but are generally more expensive. When you buy a custom T-Top, look for a shop that offers professional installation, including any wiring or welding that may be required. For both pre-made T-tops and custom-made T-tops, look for marine-grade schedule 40 anodized aluminum frames at least 1 1/2" in diameter, and insist on Sunbrella canvas for your canvas T-top. Be sure to ask about rod holders and any other accessories or additional fittings you might need. Ready-made T-tops can be purchased for a lower cost than custom T-tops, and often a reasonably skilled individual can install the T-top, thus saving on installation costs as well. Ready-made T-tops may not fit your boat quite as exactly as a custom T-top, but for many boaters and fishermen, a ready-made T-top is perfectly acceptable. Custom T-tops can cost considerably more than ready-made T-tops, but can often be worth it in terms of the precise fit to your boat — not to mention the custom welding and other installation requirements. When you have a T-top custom-made for your boat, you can be assured of the most precise fit and installation possible, with a T-top designed to your exact needs. A professional T-top manufacturer will use precise measurements of your boat and do any custom welding or framebending needed to install the T-top on your boat. 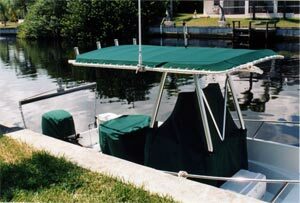 Use the same criteria in purchasing a cover for your T-top as you would in purchasing any marine canvas cover. Look for Sunbrella marine canvas, reinforced seams, UV-resistant thread, and marine grade rust-resistant grommets and fasteners. Particularly look for extra canvas reinforcing the areas where the T-top frame comes into direct contact with the canvas. A good quality canvas cover for your T-top will help it last longer and keep it looking newer for a fraction of the price of the T-top itself. "Classic Accessories StormPro T-Top Boat Cover - Charcoal - 98"""
"Classic Accessories StormPro T-Top Boat Cover - Charcoal - 102"""
"Classic Accessories StormPro T-Top Boat Cover - Charcoal - 106"""
"Classic Accessories StormPro T-Top Boat Cover - Charcoal - 116"""
"Taylor Made T-Top Boat Covers without Bow Rail - Gray - 17'5""-18'4"" x 102"""
"Taylor Made T-Top Boat Covers without Bow Rail - Pacific Blue - 17'5""-18'4"" x 102"""
"Taylor Made T-Top Boat Covers with Bow Rail - Hot Shot Acrylic Coat Polyester Fabric - 17'5"" to 18'4"" - Black"
"Taylor Made T-Top Boat Covers with Bow Rail - Hot Shot Acrylic Coat Polyester Fabric - 17'5"" to 18'4"" - Cranberry"
"Taylor Made T-Top Boat Covers with Bow Rail - Hot Shot Acrylic Coat Polyester Fabric - 17'5"" to 18'4"" - Gray"
"Taylor Made T-Top Boat Covers with Bow Rail - Hot Shot Acrylic Coat Polyester Fabric - 17'5"" to 18'4"" - Hunter Green"
"Taylor Made T-Top Boat Covers with Bow Rail - Hot Shot Acrylic Coat Polyester Fabric - 17'5"" to 18'4"" - Navy"
"Taylor Made T-Top Boat Covers with Bow Rail - Hot Shot Acrylic Coat Polyester Fabric - 17'5"" to 18'4"" - Pacific Blue"
"Taylor Made T-Top Boat Covers with Bow Rail - Hot Shot Acrylic Coat Polyester Fabric - 17'5"" to 18'4"" - Teal"
"Taylor Made T-Top Boat Covers with Bow Rail - Hot Shot Acrylic Coat Polyester Fabric - 18'5"" to 19'4"" - Black"
"Taylor Made T-Top Boat Covers with Bow Rail - Hot Shot Acrylic Coat Polyester Fabric - 18'5"" to 19'4"" - Cranberry"
"Taylor Made T-Top Boat Covers with Bow Rail - Hot Shot Acrylic Coat Polyester Fabric - 18'5"" to 19'4"" - Gray"
"Taylor Made T-Top Boat Covers with Bow Rail - Hot Shot Acrylic Coat Polyester Fabric - 18'5"" to 19'4"" - Hunter Green"
"Taylor Made T-Top Boat Covers with Bow Rail - Hot Shot Acrylic Coat Polyester Fabric - 18'5"" to 19'4"" - Navy"
"Taylor Made T-Top Boat Covers with Bow Rail - Hot Shot Acrylic Coat Polyester Fabric - 18'5"" to 19'4"" - Pacific Blue"
"Taylor Made T-Top Boat Covers with Bow Rail - Hot Shot Acrylic Coat Polyester Fabric - 18'5"" to 19'4"" - Teal"
"Taylor Made T-Top Boat Covers without Bow Rail - Gray - 18'5""-19'4"" x 102"""
"Taylor Made T-Top Boat Covers without Bow Rail - Gray - 19'5""-20'4"" x 102"""
"Taylor Made T-Top Boat Covers without Bow Rail - Pacific Blue - 18'5""-19'4"" x 102"""
"Taylor Made T-Top Boat Covers without Bow Rail - Pacific Blue - 19'5""-20'4"" x 102"""
"Taylor Made T-Top Boat Covers with Bow Rail - Hot Shot Acrylic Coat Polyester Fabric - 19'5"" to 20'4"" - Black"
"Taylor Made T-Top Boat Covers with Bow Rail - Hot Shot Acrylic Coat Polyester Fabric - 19'5"" to 20'4"" - Cranberry"
"Taylor Made T-Top Boat Covers with Bow Rail - Hot Shot Acrylic Coat Polyester Fabric - 19'5"" to 20'4"" - Gray"
"Taylor Made T-Top Boat Covers with Bow Rail - Hot Shot Acrylic Coat Polyester Fabric - 19'5"" to 20'4"" - Hunter Green"
"Taylor Made T-Top Boat Covers with Bow Rail - Hot Shot Acrylic Coat Polyester Fabric - 19'5"" to 20'4"" - Navy"
"Taylor Made T-Top Boat Covers with Bow Rail - Hot Shot Acrylic Coat Polyester Fabric - 19'5"" to 20'4"" - Pacific Blue"
"Taylor Made T-Top Boat Covers with Bow Rail - Hot Shot Acrylic Coat Polyester Fabric - 19'5"" to 20'4"" - Teal"